Closing out 2018 with an update on my professional life. I recently accepted a long-term contract position as a Digital Marketing Specialist, focusing on a website migration. In this new role, I am learning a new CMS, SDL Tridion, which I am very excited about! Equally as exciting are the super talented marketing and digital professionals I am working with. They continue to impress with their knowledge and ability to troubleshoot. Helping small businesses reach their digital goals remains an important part of my work, however, at the moment, my time is limited. 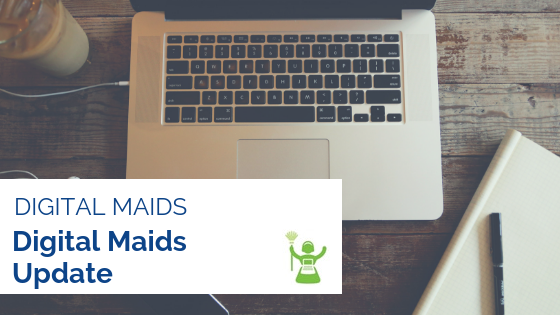 If you need the support of Digital Maids, please message me. Size and scope of any new projects will need to be considered. When deciding upon which social media networks to use for their local business, many small business owners ultimately include Instagram. And for good reasons. With over 600 million users, Instagram business pages that post quality content often see a high rate of engagement while building a strong online community. Instagram offers a variety of creative ways to share content with your Followers, and continually updates its features, business insights, and overall functionality. Given that Instagram is owned by Facebook, it’s important to note that both social media networks are ad-based revenue companies. Therefore, paid advertising should certainly play a recurring role in your long-term Instagram marketing strategy. However, if you maximize your posts for discovery, some organic reach is still possible! 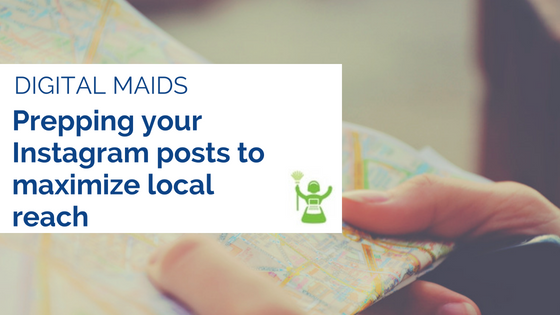 Here are five tips for prepping your Instagram posts to maximize local reach. Since location-based posts become discoverable when Instagram users search by location, don’t forget to include this nugget of information. To broaden your reach, occasionally change up the location by choosing your city, region, or state. Hashtags have long been a part of gaining new followers on Instagram, and even more so now that hashtags can be followed. Do your research and document popular hashtags specific to your area. The actual name of your business or a hashtag created for your business or products are both great ways to reinforce your brand. However, you can also include a hashtag that combines your business name or product with your location. For example, a bakery located in Boston may include #bostoncoffee, to reflect both a popular menu item and their location. Sprinkle your posts with eye-catching images of your storefront or street to help users easily recognize you. Play around with the best times of days to capture natural light. Interesting weather, sunsets, and sunrises are also fun, engaging images and videos to share. Stay in tune with local events and happenings in your area. An annual road race or charity walk, for example, presents a unique opportunity to show community support. Even better if you or an employee is participating, or your business is sponsoring! For many small business owners, the new year is a time to finally take on a growing to-do list. 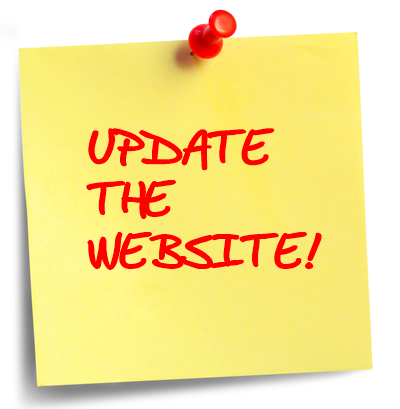 Have you found time to update your website and social media business pages for the new year? If you have not done so already, take twenty minutes to perform the following updates listed below. Making these small changes sends a clear signal to your website visitors that you are open for business. Typically located in the footer, this is a quick way to your online audience on EVERY page of your website that you are an active business. Although some website themes may update copyright information automatically, it is important to confirm. Perform a quick review of all links and content in the header and footer. Header and footer content is critical because it is highly visible and often links to your social media networks and other pertinent contact information. Be sure all links are working correctly and contact information is accurate. Update your contact form to incorporate the new year. “How can help we reach your goals in 2019?”, for example, or “we look forward to working with you in 2019!”. Do you have a specific time of year that is busy? Relay this information to potential customers, and articulate how best they can arrange time to meet with you. You know that house that still has a Christmas or holiday themed wreath still hanging on their front door? Don’t be that house in the digital world. Remove or update any holiday-related content or promotions, particularly on your homepage. Consider replacing it with a show of appreciation – “thank you to all our customers for an amazing 2018.” If you don’t have time to draft fresh copy, repurpose existing content. Your company history, for example, or a short summary your of your most popular products and services. Highlight your most important blogs or images of the past year with a simple Year in Review page. This not only saves your visitors some searching but also presents a great summary of your business. If your website is powered by WordPress, try using a photo gallery plugin to showcase images that represent the entire year. Review of your website links, particularly for Instagram and Twitter bios. Instagram and Twitter only give you one link, make the most of it! Create a story on Instagram or Facebook with highlights of the previous year. Then add to your profile to give it a longer shelf life. Even if they’re not done perfectly, completing the above tasks sends the right message to your customers and prospects. That you are present and open for business! Corporate sponsorships play an integral role in non-profit fundraising and are usually critical to achieving financial goals. Given their importance, acknowledging sponsors on your social media networks should be an essential piece in your overall social media strategy. Ultimately, you want your sponsor to return for future fundraising initiatives. Making your sponsor feel special is one way to make that happen. This is perhaps the easiest way to express appreciation while giving your sponsors social media accounts some added visibility. In your accompanying text, be sure to capture why your sponsor is unique and/or an asset to the community. Your followers will only need that magical 1-click to check out, and hopefully, follow your sponsor’s page. Facebook, Instagram, and Snapchat all have a Stories feature – bite-size content that is only viewable for twenty-four hours. Use this feature to give a thank you shout out. If you are low on visual content, a selfie with fun and correlating stickers will do nicely. Given the short lifespan of this content, make it light in tone, and crisp and to the point! Bonus – tag your sponsors Facebook/Instagram/Snapchat business page in your Story. Post a short video with the Chairperson or well-known board member of your non-profit communicating your thank you. This type of post can be memorable, particularly if you can share a little-known story, or spotlight the sponsor’s philanthropy. Bonus– If the sponsor’s organization is local, go the extra mile and create the video in their store or office. Is your sponsor in the midst of promoting a new product or event? Use your social media thank you to give it some timely online exposure. For this kind of content, be sure to always post high-quality pictures or video. You want everything about your sponsor – their products, their storefront, their employees – displayed in the best possible light. Do you have a sponsor that distributes a lot of press releases, receives regular positive media mentions, or is periodically in the news? Share a favorable article with a caption that incorporates your thank you. If your sponsor has a Facebook page, extend the shelf life of your accolades by posting directly to their page in the form of a visitor post or review. When visitors come to check out the sponsor’s Facebook content, your comments will be seen. In general, these types of posts greatly improve the validity of the page. Yes, staying informed about the constantly shifting features of social media can be difficult. 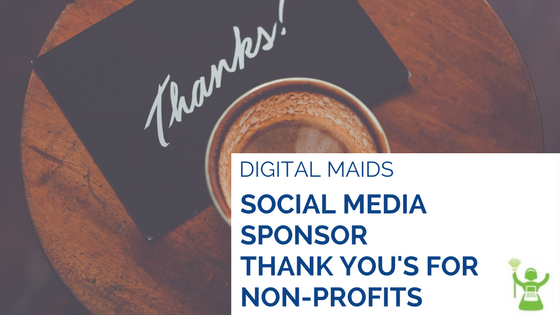 However, each time a social media network introduces a new feature or type of content that can be shared presents a new opportunity for your non-profit to thank your sponsors. 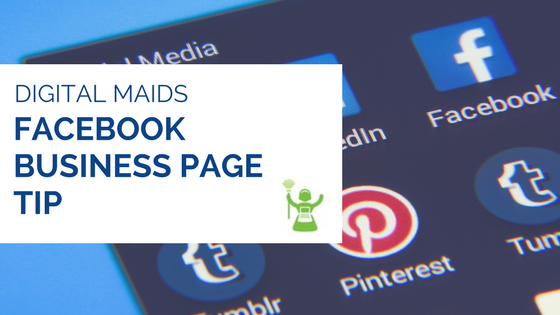 Many business owners opt to review visitor posts to their Facebook Business Page prior to making them public. This option is exercised for a variety of reasons – unhappy former employees, not enough resources to monitor the page in real time, or simply ensuring nothing inflammatory is aired on their page. 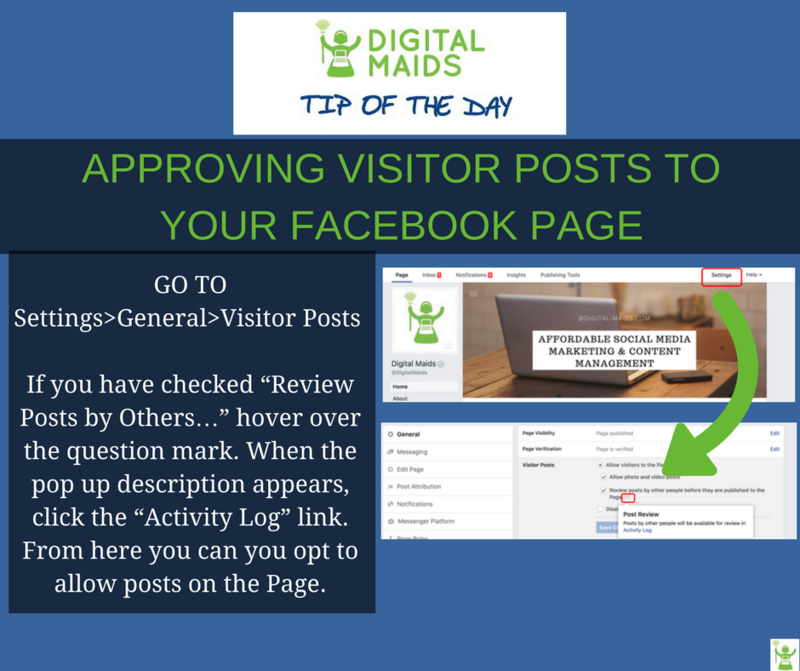 Regardless of the reason, here is how to review and then make public visitor posts to your Facebook Page. The amount of online content is crushing all of us, particularly on social media. On Facebook alone, 510,000 comments are posted, 293,000 statuses are updated, and 136,000 photos are uploaded every 60 seconds. This explosion of content impacts both the businesses using social media for marketing as well as the users they are hoping to reach. If you are a content marketer or small business owner managing your own social media pages, it can be tempting to take a few shortcuts in the hopes getting your content out ahead of the pack. However, not all shortcuts are created equal. Resist the urge to sacrifice quality! Just like you, your customers have only 24 hours in their day. Don’t clog their social media feeds with subpar content. Reward their attention and time by giving them your best. 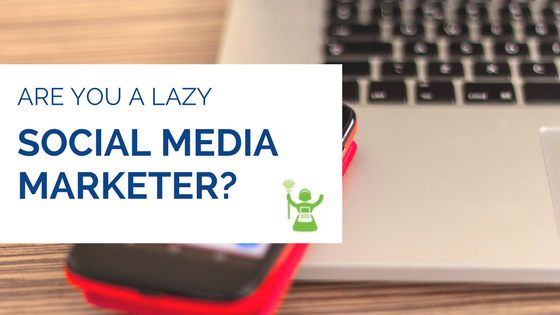 To up the quality of your content and overall social media presence, avoid falling into these 5 common lazy social media habits. According to a recent study, 6 out of 10 social media users share links without reading them. Yikes! How can you expect to be influential if you don’t know what you have shared beyond the title? Some organizations are considering ways to combat this type of thoughtless sharing. For example, Facebook is currently looking into letting users know how widely a link has been read when it is shared. If you’re going to share, first read the article, and even better, offer your Followers value in the form of adding your key takeaway or insight. The optimal image dimensions for posts in Facebook’s newsfeed differ from Instagram or Twitter. In fact, each social media network has its own recommended height and width for sharing images. Take the time to format your images accordingly. Apps such as Canva and PicMonkey will help simplify the process. Ditto for copy and captions. A caption crafted for maximum Facebook exposure probably won’t play well on Twitter. Take the time to write in the style best suited to the platform your Follower are using. Yes, liking other users post is an important component of engagement and building your online community, but go the extra mile or keyboard stroke and comment or react. What about the image or post initially grabbed your attention? It is also worth noting that Facebook now ranks reactions higher, which impacts your Insights. So let other users feel your engagement. With persistence, what goes around comes around! You know those Twitter accounts that simply automatically share all of their Facebook status updates? Do you read them? Chances are, no one is reading yours either. Creating and posting all of your content for one social media channel and then auto sharing it to all of your other networks should not be your sole strategy. In some ways, it’s not respecting the other networks and its users. A social media scheduler such at Hootesuite or HubSpot can help you create and schedule unique posts tailored for each of your networks. Social media is two words. Many businesses focus so much on the media, they forget the social piece. When you receive a lot of comments on your Instagram post, do you take the time to respond or acknowledge? Not every post has to be an overt promotional sell. Take the time to share gratitude, a personal side, or humor. Ultimately, the attentiveness that is required to be successful in real life social situation holds true for thriving in social media. Like all forms of marketing, social media works best when you heed even the smallest of details. 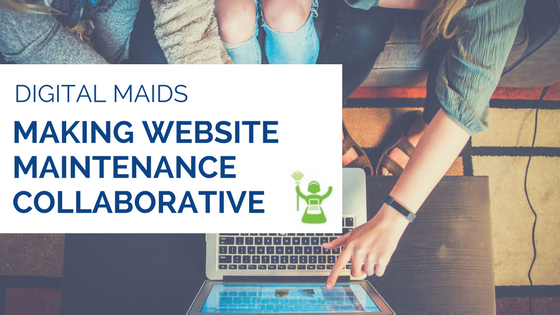 If the idea of adding “update the company website” to your to-do list seems daunting and time consuming, it’s probably the reason why you keep putting if off for another day. However, each day that you delay puts into a motion a vicious cycle. 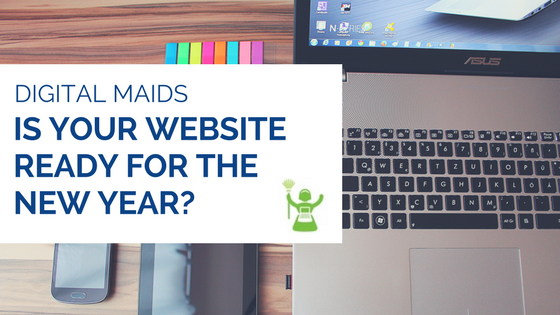 You continue to not give the attention your website needs to be a positive online experience for your visitors and stay SEO friendly, while the content updates continue to pile up, requiring even more time. When the first impression of a website is one of stale content, no one will spend a lot of time on your website. Break the cycle of content neglect by taking a few minutes to perform the following 5 updates. None of these updates require an extended amount of time to perform and will create a fresh updated look for your site that both visitors and search engines will value. If your marketing strategy opts for longer captions on your Instagram posts, be sure to break up the text with line breaks. Large, long blocks of text can be tedious to read on Instagram, and your Followers may end up skipping over your well-written caption. 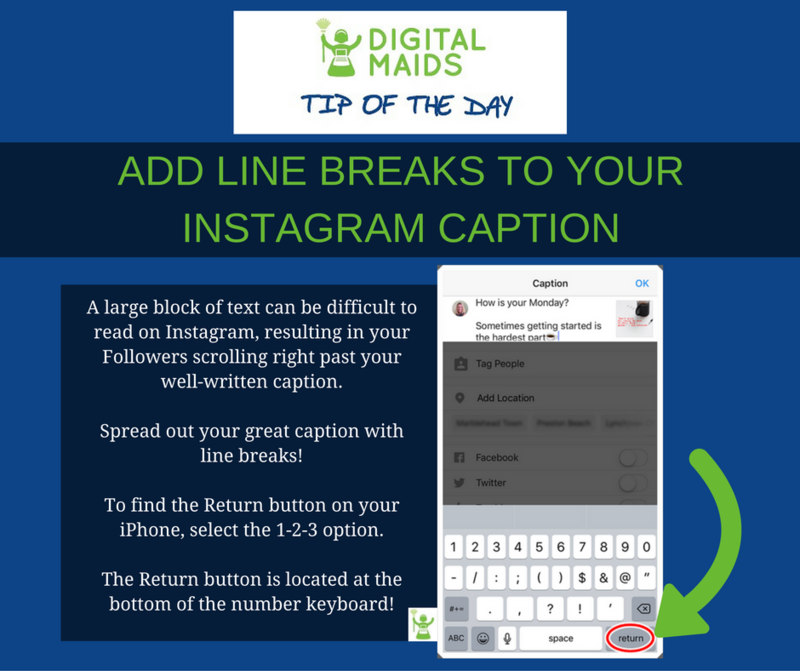 See below on where to find the Return button on an iPhone to make your Instagram captions as visually appealing as they are creatively written! Add hashtags as a comment to present a clean, easy to read caption. This way, when you share your Instagram photo to your other social media channels, the hashtags will stay on Instagram, and only your great caption will be shared. What’s easier to remember, www.linkedin.com/in/sheilaheff or www.linkedin.com/in/sheilaheffernan-21a1b836 ? 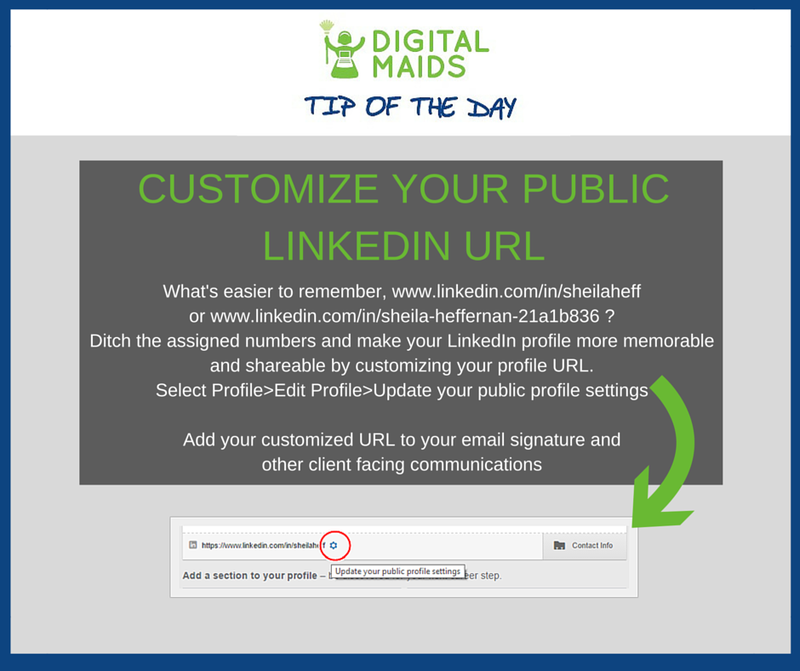 Ditch the assigned numbers and make your LinkedIn profile more memorable and shareable by customizing your profile URL. Select Profile>Edit Profile>Update your public profile settings. Don’t forget to add your customized link to your email signature!